Pre-published rates offer instant quote and eliminate hassles and delays of completing a long application and waiting weeks just to get a quote. Our prices are lower because we only insure smaller to medium-sized health clubs that have lower risks compared to the jumbo health clubs. You are not required to join another expensive association to be eligible. Exercise Studio Program: Specifically designed to meet the unique needs of U.S.-based owners and operators of studio facilities (with less than 3000 sq. ft. of space) that offer personal/individual training, exercise, aerobics, yoga, or Pilates activities, where people participate in scheduled fitness programs under the direct supervision of a fitness professional such as a personal trainer or exercise instructor. Circuit Training Studio Program: Specifically designed to meet the unique needs of U.S.-based owners and operators of circuit training workout facilities (with less than 3000 sq. ft. of space) that exclusively offer circuit training exercise programs. Health Club Program (Limited Services): Specifically designed to meet the unique needs of U.S.-based health clubs (with up to $500,000 in annual sales) that offer programs and services that may include personal training, aerobics, yoga, Pilates, free weights, resistance machines, cardio machines, and a variety of exercise classes for members. Exercise Studios and Circuit Training Studios that are not eligible under Programs 1 and 2 above because they exceed 3000 sq. ft. in space may be eligible under this program. Click here for free articles and reports on how to protect yourself against devastating injuries and lawsuits in your health club. Treadmills are the leading cause of equipment-related injuries, most due to falls and tripping over/on. 224 weight machine and free weights injuries. 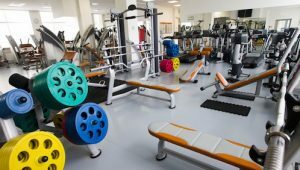 Common gym equipment related injuries include broken ankles, fractured arms, fractured legs, and fingertip amputations. Inattention due to iPods, cell phones, and reading. Working out too hard or too soon after a period of inactivity. Signage in a fitness center serves several roles. Warning, policy/procedure, announcement and directional signs are all important to the safety of fitness center clients and protecting your business and staff from liability claims. These signs serve as silent staff members, reminding clients of safety procedures and cautioning them of potential dangers. These can include warnings of wet floors in sauna/pool/shower areas, improper use of equipment, and use of spotters in weight areas. 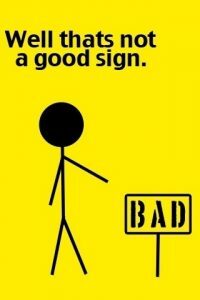 Warning signs should be professionally printed and posted strategically where they can be seen clearly and at eye level or no higher than 6’ from the ground. Despite the best efforts of your staff, accidents and emergencies will occur. Your facility should have written emergency procedures in the event an injury illness or an emergency such as fire, tornado, or power outage. If there is AED equipment (defibrillator) on site, at least one staff member trained in the use of the AED should be on site at all times. View the American Safety Training Institute video below for general information on AED procedures.